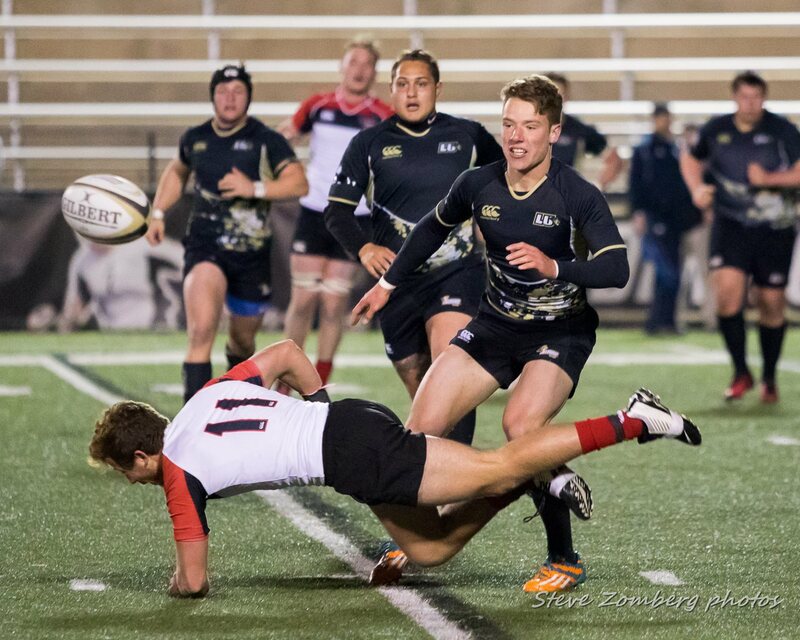 Lindenwood University defeated Davenport 32-10 in the only Mid-South game of the weekend Saturday night. Clemson's matchup with Arkansas State was called off due to severe weather. For Lindenwood, this was an important result as the Lions looked to get back near the top of the conference. Wesley White opened up the scoring with a try in the opening minute - Lindenwood kicked off, Davenport kicked out of their 22, and White ran it right back down the field to score. Danveport clamped down defensively for almost the next 20 minutes, but then flanker Michael de Waal went over to make it 10-0. Davenport replied with a try from lock Mike Lau, and then prop Connor Schilling tied it up. Lindenwood gave up that second try while down a man as flyhalf Nick Feakes received a yellow card. The game stayed at 10-10 for about 20 more minutes. It wasn't until the 54th minute that Lindenwood wing Sam Chapman scored to put his side ahead. Lungile Tshuma converted to make it 17-10 and added a penalty goal moments later. In the final 11 minutes Lindenwood put in tries from scrumhalf Giovanni Falco and wing Christian Rodriguez to put it away, but the game was certainly very close for most of the evening. "It's always a tough fixture with so many emotions in the air," said Tshuma, referring to the fact that this was the Charles Labry Shield, named after a Lindenwood player who died. "We are however always happy to come out on top for not only the conference but the people we were remembering today. Credit to Davenport for making us work hard for it." "We were a bit anxious walking onto the pitch, knowing how much the shield means to our Lindenwood family," added lock Jimmy Lillis. "We started slow and let them out of trouble easy with a couple unfortunate penalties in our own twenty two, but once we started attacking we were able to play how we wanted to play and protected the Charles Labry shield." Lindenwood Head Coach Josh Macy said he felt the quick start was good, but his team didn't press the advantage. Tshuma and Feakes were very effective setting up plays out wide, with Chapman and Rodriguez were solid in support. On defense, freshman Michael De Waal had a huge impact and continually stole ball in the breakdown. Lillis, who moved from wing to lock this year, had a big game in the lineout and was able to use his mobility to support. Said Macy - "he thinks wing is boring now." This was the 4th playing of the Labry Shield, named after French-born Charles Labry, who died in a traffic accident while attending Lindenwood. Labry's family flew over from France for the match, addressed the team in the locker room before the game, and presented the shield to the Lindenwood players afterward. "You could see how much it meant to them that we honored their son’s name," said Macy. "And watching them well up with thankful tears as they hugged our players post-match was probably one of my most memorable moments a coach." With the victory, Lindenwood moves to 1-1-1. Davenport drops to 0-3 and still has one more road game to play before finishing up the season at home.